We bring you last week's top performances from Venezuelans who are playing abroad and who all have had prior experience of national team duties at youth or senior level. #1. This week's number one is an experienced international center Windi Graterol (204-86, agency: Pro Sports, currently plays in Brazil). He could not help Brasilia (5-13) in their last game. Despite Graterol's good performance Brasilia lost 80-87 at home to the higher-ranked (#11) SKY/Basquete. He had a double-double by scoring 12 points and getting 11 rebounds in 31 minutes on the court. It's Graterol's first season with the team. Graterol has relatively good stats this year: 12.2ppg, 6.6rpg, 2FGP: 58.9%(83-141) and FT: 63.4% in 18 games he played so far. Ex-Cocodrilos de Caracas player is currently a member of the Venezuelan senior national team. #2. Second place goes to an international swingman Pedro Chourio (186-90, also represented by Pro Sports, currently plays in Argentina). He led Estudiantes Concordia to a surprising victory over the seventh-ranked Boca Juniors (9-7) 67-60 in the Argentinian La Liga last Saturday. Chourio was MVP of the game. He recorded 20 points. Estudiantes Concordia (5-10) is placed 16th in the La Liga. This season Chourio averages: 8.2ppg, 4.2rpg, 2FGP: 36.1%, 3FGP: 36.1% and FT: 79.2%. Ex-Trotamundos de Carabobo player is in the roster of the Venezuelan senior national team. #3. The Venezuelan player who performed third best last week abroad was an international swingman Dwight Lewis (197-87, college: USC, currently plays in Argentina). He led Gimnasia to a 3-point victory against the ninth-ranked Libertad Sunchales (8-7) 82-79 in the Argentinian La Liga on Wednesday night. Lewis scored 12 points, made 3 passes and 3 steals in 35 minutes. Gimnasia y Esgrima Comodoro Rivadavia (9-5) is placed fifth in the La Liga. This year Lewis has relatively solid stats: 14.2ppg, 2.7rpg, 2.0apg, 2FGP: 51.9%, 3FGP: 33.3% in 14 games. He is a naturalized American. Lewis is also a member of the Venezuelan senior national team. He used to play for Trotamundos de Carabobo in Venezuelan league. #4. Small forward Donta Smith (201-83, college: SE Illinois JC, currently plays in France) contributed to Pau-Lacq-Orthez's victory against the closely-ranked JDA Dijon (17-3) 63-59 in the French Jeep ELITE in Sunday night's game. Smith recorded a double-double by scoring 10 points and getting 11 rebounds. He also added 5 assists. It was the game of the round between two top 4 ranked teams. Elan Bearnais Pau-Lacq-Orthez (13-6) is placed second in the Jeep ELITE. Smith has reliable stats this season: 12.7ppg, 6.7rpg, 4.4apg and 1.2spg. He is a naturalized American. Smith used to play for the Venezuelan national team back in 2015. He played also for Marinos de Anzoategui in Venezuelan league. #5. International center Gregory Echenique (206-90, agency: Pensack Sports, college: Creighton, currently plays in Japan) was the major contributor in a Shimane Magic's victory against the fifth-ranked Bambitious Nara (10-28) 89-80 in the Japanese B2 League last Sunday. Echenique had a double-double by scoring 22 points and getting 15 rebounds. He also added 2 blocks in 40 minutes. Shimane Susanoo Magic (29-10) is placed first in West group. It was his team's ninth consecutive victory in a row. Echenique has individually a very good year with high stats. He averages: 19.4ppg, 14.3rpg, 2.3apg and 1.6bpg in 36 games. Echenique plays currently for the Venezuelan national team. #6. Point guard John Cox (195-81, another player represented by Pensack Sports, college: USF, currently plays in France) led Sluc Nancy to a victory over the league leader Chorale de Roanne (14-4) 86-70 in the French ProB (second division) on Saturday night. He was the best player in that game. Cox scored 23 points and added 4 assists. It was the game of the round between two top 4 ranked teams. Sluc Nancy Basket Pro (13-5) is placed second in the ProB. It was his team's sixth consecutive victory in a row. Cox's stats this season are: 11.7ppg, 1.8rpg and 2.6apg. He is a naturalized American. Cox is a former international player as he played for the Venezuelan senior team two years ago. He used to play for Marinos de Anzoategui in Venezuelan league. #7. International forward Miguel Ruiz (197-90, another player represented by Pro Sports, currently plays in Uruguay) managed to help Club Trouville Montevideo in a victory against the closely-ranked Defensor (16-9) 82-70 in a derby game in the Uruguayan LUB in Thursday night's game. Ruiz scored only 2 points and grabbed 8 rebounds in 30 minutes. Club Trouville Montevideo (15-10) is placed seventh in the LUB. His team will play only one more game in the Regular Season. And that game will be critical. This year Ruiz's overall stats are: 4.8ppg, 9.7rpg, 2.0apg and 2.1spg in 20 games. He is also Venezuelan national team player. #8. Point guard Harold Cazorla (175-91, currently plays in Spain) contributed to an Fontedoso Carrefour's victory against the sixth-ranked Estela (12-9) 78-72 in the Spanish LEB Silver (third division) last Saturday. Cazorla scored 15 points, had 7 rebounds and dished 6 assists. Avila Autentica Carrefour (9-12) is placed ninth in West group. They ended the series of three consecutive loses. His team will play only one more game in the Regular Season. And now that game is very crucial. Cazorla's total stats this season are: 9.5ppg, 4.4rpg, 5.2apg and 2.3spg. He used to play for the Venezuelan national team back in 2017. #9. Former international power forward Francisco Centeno (203-85, currently plays in Chile) contributed to an easy victory against the leader Las Animas (20-7) crushing them 88-58 in the Chilean Liga Nacional in Wednesday night's game. He recorded 11 points, 7 rebounds and 4 assists. It was the game of the round between two top 3 ranked teams in group Conferencia Sur. Asociacion Basquetbol Ancud (0-2) is placed first in Conferencia Sur. Centeno's team will play only one more game in the Regular Season. And now that game is quite important. Centeno averaged so far 12.0ppg, 5.0rpg and 2.5apg. He used to play for the Venezuelan national team seven years ago. #10. Swingman Rafael Perez (193-82, currently plays in Liga Americas) contributed to Capitanes' victory against the closely-ranked Libertadores (1-1) 86-75 in the Liga Americas last Saturday. Perez scored 5 points in 12 minutes. It was his first game for Capitanes this season. It was the game of the round between two top 4 ranked teams. His team is placed second in the Liga Americas. His team will play only one more game in the Liga Americas Regular Season. And now that game is extremely important. Perez is a former international player as five years ago he still played for the Venezuelan senior national team. #11. International guard Jhornan Zamora (196-89, currently plays in Spain) contributed to a 3-point Ourense's victory against the closely-ranked Oviedo CB 81-78 in the Spanish LEB Gold (second division) on Saturday night. He scored 11 points. This season Zamora has very high stats. He averages: 15.6ppg, 2.9rpg, 1.8apg and 1.5spg. Zamora plays currently for the Venezuelan national team. #12. Former international center Luis Julio (201-80, currently plays in Chile) contributed to an easy victory against the fifth-ranked Espanol de Talca 94-75 in the Chilean Liga Nacional in Sunday night's game. He had a double-double by scoring 18 points and getting 13 rebounds. Julio also added 4 assists in 34 minutes. Julio's stats this year are: 14.4ppg, 10.1rpg and 2.4apg in 29 games. He used to play for the Venezuelan national team back in 2009. #13. Former international forward Luis Valera (202-88, college: UTRGV, currently plays in Spain) contributed to Azuqueca's victory against the eighth-ranked Menorca 67-60 in the Spanish LEB Silver (third division) last Saturday. Valera scored 7 points and grabbed 4 rebounds. Valera's total stats this season are: 7.4ppg and 3.1rpg. He used to play for the Venezuelan national team four years ago. #14. Former international forward Juan Coronado (203-90, college: Liberty, currently plays in Liga Americas) contributed to a 3-point Libertadores' victory against the closely-ranked Leones 112-109 in the LNBP on Friday night. Coronado recorded only 2 points in 3 minutes on the court. This year Coronado's total stats are: 7.4ppg and 3.1rpg in 21 games. He used to play for the Venezuelan national team back in 2016. #1. Osbel Caraballo (196-F-98, currently plays in NCAA2) could not help the St. Thomas Aquinas College in their last game. Despite Caraballo's very good performance the St. Thomas Aquinas College was edged 68-66 on the road by the Bridgeport University. He had a double-double by scoring 15 points and getting 12 rebounds. Caraballo also added 2 blocks in 24 minutes. Caraballo's stats this year are: 13.3ppg and 7.6rpg in 17 games he played so far. #1. This week's number one is an international center Gregory Echenique (206-90, agency: Pensack Sports, college: Creighton, currently plays in Japan). 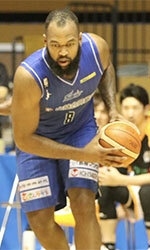 He led Shimane Magic to a victory over the third-ranked Dragonflies (32-24) 76-69 in the Japanese B2 League in Sunday night's game. Echenique was MVP of the game. He had a double-double by scoring 18 points and getting 14 rebounds in 40 minutes on the court. It was the game of the round between two top 3 ranked teams in group West. Shimane Susanoo Magic (40-16) is placed second. The Regular Season already ended. It's Echenique's first season with the team. Echenique has individually a very good year with high stats. He averages: 19.0ppg, 13.7rpg, 2.4apg, 1.5bpg, 2FGP: 61.2%(398-650) and FT: 74.0% in 54 games he played so far. Echenique is currently a member of the Venezuelan senior national team. #2. Second place goes to an experienced international center Windi Graterol (204-86, agency: Pro Sports, currently plays in Brazil). He was the major contributor in Brasilia's victory against the sixth-ranked Corinthians (12-14) 87-78 in the Brazilian NBB last Saturday. Graterol recorded a double-double by scoring 16 points and getting 18 rebounds. Universo/Caixa/Brasilia (10-16) is placed tenth in the NBB. Graterol has relatively good stats this season: 13.1ppg, 7.9rpg, 2FGP: 58.8%(143-243), 3FGP: 26.2% and FT: 71.0%. Ex-Cocodrilos de Caracas player is in the roster of the Venezuelan senior national team. #3. The Venezuelan player who performed third best last week abroad was an international swingman Dwight Lewis (197-87, college: USC, currently plays in Argentina). He contributed to a 3-point Gimnasia's victory against the closely-ranked Instituto (16-8) 83-80 in the Argentinian La Liga on Monday night. Lewis recorded 11 points and grabbed 6 rebounds in 31 minutes. Gimnasia y Esgrima Comodoro Rivadavia (16-11) is placed sixth in the La Liga. This year Lewis has relatively solid stats: 13.3ppg, 2.8rpg, 1.7apg, 2FGP: 49.4%, 3FGP: 29.6% and FT: 72.5% in 27 games. He is a naturalized American. Lewis is also a member of the Venezuelan senior national team. He used to play for Trotamundos de Carabobo in Venezuelan league. #4. Power forward Francisco Centeno (203-85, currently plays in Chile) could not help AB Ancud (0-2) in their last game on Saturday. Despite Centeno's good performance the first-placed AB Ancud (0-2) was defeated 93-83 on the road by the second-ranked Deportivo Valdivia in the Conferencia Sur. He scored 12 points and grabbed 5 rebounds. Centeno has reliable stats this season: 13.2ppg, 5.8rpg and 2.0apg. He used to play for the Venezuelan national team back in 2012. #5. International forward Miguel Ruiz (197-90, also represented by Pro Sports, currently plays in Uruguay) was not able to help Trouville in their game against Urunday Universitario (2-3) in the Uruguayan LUB. Ruiz scored 7 points, had 13 rebounds and dished 3 assists in 28 minutes. Trouville (#4) was edged 76-75 in a derby game by the lower-ranked (#5) Urunday Universitario in the Places 1-6 group. It was Trouville's third consecutive loss in a row. This year Ruiz's overall stats are: 4.4ppg, 9.1rpg, 1.9apg and 1.8spg in 29 games. He plays currently for the Venezuelan national team. #6. Swingman Pedro Chourio (186-90, another player represented by Pro Sports, currently plays in Argentina) contributed to a Estudiantes Concordia's victory against the closely-ranked La Union (12-27) 84-80 in the Argentinian La Liga on Wednesday night. Chourio scored 15 points and grabbed 4 rebounds. Estudiantes Concordia (15-12) is placed eighth in the La Liga. It was his team's third consecutive victory in a row. Chourio's total stats this season are: 8.7ppg, 4.4rpg and 1.3spg. He is an international player who is currently on the senior Venezuelan National Team roster. #7. International forward Michael Carrera (196-93, agency: Duran International, college: S.Carolina, currently plays in Argentina) was not able to secure a victory for Obras Basket (3-3) in their game against Gimnasia (16-11) in the Argentinian La Liga. Carrera scored 8 points in only 9 minutes. It was his first game for Obras Basket this season. Obras Basket was crushed 103-81 in Comodoro Rivadavia by the lower-ranked (#6) Gimnasia. Carrera is a naturalized American. He is also Venezuelan national team player. Strangely Carrera has never played in Venezuela. #8. Guard Jhornan Zamora (196-89, currently plays in Spain) couldn't help Ourense (18-12) in their last game on Saturday. Despite his very good performance Ourense was defeated 82-70 at home by the second-ranked RETAbet BB. 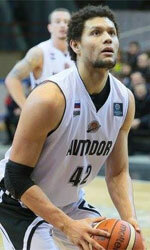 Zamora was the top scorer with 18 points. There are only four games left until the end of the Regular Season. So now every game will be critical. Zamora averaged so far 15.0ppg, 3.0rpg, 2.0apg and 1.2spg. He plays currently for the Venezuelan national team. #9. Former international swingman Rafael Perez (193-82, currently plays in Puerto Rico) helped Capitanes win their game against the closely-ranked Cariduros (5-8) 98-94 in the Puerto Rican BSN on Thursday night. Perez scored 6 points in only 10 minutes. Capitanes de Arecibo (7-6) is placed fourth in the BSN. They ended the series of four consecutive loses. This year Perez averages only 3.5ppg in 13 games. He used to play for the Venezuelan national team five years ago. #10. Point guard Harold Cazorla (175-91, currently plays in Spain) couldn't help Fontedoso Carrefour (12-17) in their last game on Saturday. Despite Cazorla's good performance Fontedoso Carrefour (#9) was defeated 78-71 on the opponent's court by the lower-ranked Vic (#11) in the West group. He was the second best scorer with 13 points. Cazorla also added 4 passes. Cazorla's total stats this season are: 9.6ppg, 4.1rpg, 4.5apg and 2.0spg. He is a former international player as two years ago he still played for the Venezuelan senior national team. #11. Former international forward Luis Valera (202-88, college: UTRGV, currently plays in Spain) couldn't help Azuqueca in their game against Estela in the Spanish LEB Silver (third division). Valera scored 5 points and grabbed 4 rebounds in 16 minutes. His team lost 77-92. This year Valera's total stats are: 8.1ppg and 3.4rpg in 29 games. He used to play for the Venezuelan national team four years ago. The most exciting game of round 6 in the Serie A took place in Valencia. This derby game ended with only two-point home defeat of 3rd ranked Guerreros (3-3) to second ranked Recicladores (5-1) 92-90 on Saturday evening. Recicladores have an impressive five-game winning streak. They keep a position of league leader, which they share with Broncos. Guerreros at the other side keep the third place with three games lost. Recicladores will have a break next round, and it should allow them to practice more before next game. Guerreros will play on the road against the league's leader Broncos in Caracas and it may be a tough game between close rivals. Another interesting game was a derby match between two teams from Caracas: Broncos (#1) and Diablos (#6). Diablos were defeated at home 84-89 and even the fact of playing on their own court did not help. Broncos have a solid three-game winning streak. They maintain first position with 5-1 record, which they share with Recicladores. Diablos lost fifth consecutive game. They keep the sixth place with five games lost. Broncos will play against Guerreros (#3) in Valencia in the next round, which may be the game of the day. Diablos will have a break next round. Another interesting game was again a derby between two local teams from Caracas: Broncos (#1) and Comuna (#5). Broncos (5-1) won against visiting Comuna (2-4) 75-64. It ended at the same time the two-game winning streak of Comuna. Broncos have a solid three-game winning streak. They maintain first position with 5-1 record, which they share with Recicladores. Loser Comuna dropped to the fourth place with four games lost. They share the position with Atleticos. Broncos will meet at home Guerreros (#3) in the next round, which may be the game of the day. Comuna's supporters look forward to another derby game next round, where their team will face at home their local rival from Caracas Atleticos. Another interesting game was again a derby match of two teams from Caracas: Diablos (#6) and Atleticos (#4). Diablos (1-5) won against visiting Atleticos (2-4) 80-65. Diablos maintains sixth position with 1-5 record. It was Atleticos' fourth loss in a row. They keep the fourth place with four games lost. Diablos will have a break next round. Atleticos' supporters look forward to another derby game next round, where their team will travel locally in Caracas to the arena Comuna. An interesting game for Cangrejeros (3-2) which hosted in Maturin one of their biggest challengers Acereros (2-3). Second ranked Cangrejeros had an easy win 87-59. It ended at the same time the two-game winning streak of Acereros. Cangrejeros maintains second position with 3-2 record having just three points less than leader Gladiadores. Loser Acereros dropped to the third place with three games lost. Cangrejeros will have a break next round. Acereros will play against the league's leader Gladiadores and it may be a tough game between close rivals. In the last game of round 6 Margarita lost to undefeated Gladiadores on the road 64-107. No shocking result in a game when top-ranked Gladiadores (5-0) crushed at home 3rd ranked Margarita (2-3) 107-64 on Saturday. Gladiadores have a solid three-game winning streak. They maintain first position with 5-0 record. Loser Margarita keeps the third place with three games lost. Gladiadores will face Acereros (#3) in Ciudad Bolivar in the next round, which may be the game of the day. Margarita will play at home against Buffalos and it may be a tough game between close rivals.